It is easy to find a news story from CNN or the New York Times about coral reefs. Now think about forests, would it be equally easy to find articles about forests? Likely not. While neither system is more important than the other, forests have received less attention over the years than other ecosystems that exist. One problem that has kept us from better understanding is that experimental design and methods of information gathering on forest communities have been largely taken from experiments carried out on prairie, and aquatic systems. While not ideal, this borrowing of methods and theories and reapplying them to ‘fit’ forest ecology has long been the practice. With forest stretches dwindling, only 33% of land is covered in forest in the US, researchers are looking to improve on carrying out research in place (the forest), to make it more applicable and customized so they can start to answer some questions related to restoration, sustainability and maintaining biodiversity. Over the last few decades there has been an increase in demand for the conservation of biodiversity. Biodiversity is the number of different species within an ecosystem, such as having many different types of trees and wildflowers, as opposed to a field of corn or an orchard that only has one kind of tree. However, some researchers say that biodiversity is only part of the ‘equation’. An increase in a system’s biodiversity usually results in a more robust or resilient system. Though, some researchers do not consider the actual functions of an ecosystem, which are related to biodiversity. Ecosystem functions are the parts of an environment and how the work together. Many of the current studies on how ecosystem function relates to biodiversity exist in relation to prairie, marine and agricultural systems. As such, there is a lot more to be done to figure out the bits and pieces of how biodiversity and ecosystem functions work together in a forest. Understanding these feedback mechanisms is critical to managing overall ecosystem function and productivity, especially in future scenarios. Who doesn’t want to be more productive and live in a world that is more productive? Resilience in a forest habitat can be thought of as how well the system recovers from a disruption and how well it can withstand disturbance. While natural systems are resilient in and of themselves, through human intervention and other introduced disturbances, forest may require ‘maintenance’ to remain resilient in the face of unnatural human impacts. A group of researchers proposed a hypothesis that suggests an increase in biodiversity could ensure greater resilience in a system, making biodiversity the corner stone of a resilient system. This hypothesis is known as the ‘insurance’ hypothesis and is based on an idea that the greater number of different species filling roles in a system the more protected that system is if something were to destroy a piece of that system. For example, having more than one species of bee pollinating crops ensures that if one species of bee succumbs to disease and is wiped out, there will be other bees able to continue pollinating crops. If the system is dependent on only one species of bee the system would collapse. This is because each species has a role to play that keeps the system going, almost like a well-oiled machine. Testing the idea of system insurance, researchers are looking at how systems actually respond to disruptions and how many organisms are filling different and similar ecosystem roles. 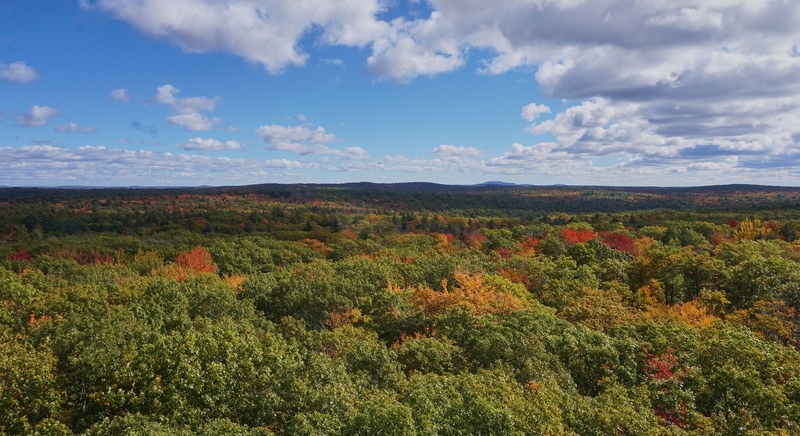 There are limited data on both of these fronts for forest communities and it is up to current and future scientists to observe and hypothesize roles and reactions specific to forests. The photo above shows the potential shifts in plant hardiness regions throughout the United States by temperature thresholds. There are groups of researchers and citizen scientists that are looking to prepare for what they feel is inevitable: zone shifts. If you’ve ever bought a plant you may notice that the tag or packet of seeds lists a growth zone. In the northeastern U.S. the common zones are 5-7. With observable climate change occurring, it is predicted that these zones will shift north making cool zones warmer. The northeastern U.S. may likely turn into zones 6-8 rather than being 5-7. This opens up the climate to growing plants that tolerate warmer temperatures. Researchers in forestry are looking to introduce plants from warmer regions to zones they are predicted to tolerate with a changing climate. There are a lot of mixed feelings about proactively working on this scenario. While many think that ecosystems need to be restored as they are or as they were in the past, there are others that want to use this opportunity to prepare forests for a change in species make up. In the end more research is needed to be able to determine what the next move will be. Whether it’s looking into how to study biodiversity across multiple systems or thinking of a more sustainable future, the field of forest ecology needs more research to better understand these unique systems. Borrowing concepts and methods from studies in other ecosystems is a good place to start, but advances are needed in order to better conserve the forests we have. Forests are iconic and a large part of the land we know and love. They are critical to our economy, providing jobs and ecosystem services that are priceless. Without a better understanding of how forests work and the role biodiversity plays they may fall into disarray leaving behind the beauty and resources we need from them. Elizabeth is a Graduate Assistant from the University of Rhode Island (URI) in Kingston, Rhode Island. She has been working with the Preisser Lab since 2015 and plans to graduate with her M.S. in 2018. Prior to being at URI, she earned her bachelors degree in biology at Unity college in Unity, Maine. She is currently working on wrapping up her thesis and pursuing a job in science education. Elizabeth is from Massachusetts. Will the Eurasian tench (Tinca tinca) be the newest invader to wreak havoc in the Great Lakes?